Wherever you are, Google Maps for Android helps you get around and discover new places. Today with the 6.7 release we will help you find offers from nearby businesses in the U.S. -- everything from restaurants, to salons, to city tours. Also, we’ve added indoor walking directions in the U.S. and Japan, plus 360-degree interior photos of businesses, to help you intrepidly make your way indoors and out. 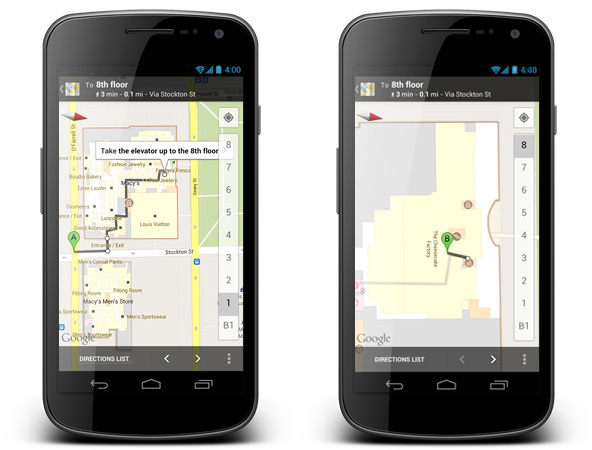 Today, in the U.S. only, we’re launching a way to discover nearby Google Offers in Google Maps for Android. To see great deals near you, tap on “Maps” to open the dropdown menu and then tap on “Offers.” If you see something you like you can click on it to learn more. Some Google Offers can be purchased and saved for later while others are immediately available for free. With free Google Offers, press “Use now” to redeem instantly or “Save for later” for future use. You can also opt-in to receive notifications in the app when there are offers near you. Explore the great indoors with walking directions and Business Photos. Since we launched indoor maps in the U.S. and Japan in Google Maps for Android last November, business owners have been adding their floor plans to our maps with Google Maps Floor Plans. Today, we are launching indoor walking directions for participating venues in these countries. This will help you get directions not only to a building’s front door, but also through those doors to the places where you want to go inside. With Google Business Photos you can explore panoramic photos of the inside of a business from the palm of your hand. Now you can get a feel for a restaurant or store inside as well as outside using Street View technologies. To access these 360-degree panoramic views, look for the “See Inside” section on the Place page of select businesses. Download Google Maps 6.7 for Android from Google Play, and use it as your trusted guide to help you find and discover places to eat, shop and play! You can also learn more about other great features on the Google Maps YouTube channel. The last time that Google tried to release a powerful and fully-featured app on iOS--aka Google Voice--Apple rejected it. You can thank Apple for the fact that iPhones can't do what Android does. Wow, my android phone really help me with my travels with google maps. Thanks for upgrading google maps for android. 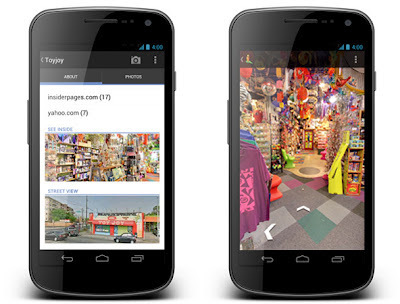 Great news for Google Business Photos! Wow! nice functions. Thanks for the informations. Im a vivid user of google maps this feature is great. I hope it gets released in the uk. Just a few questions as I am unable to test it. Does the app offer features like vibrating when near a store or sending you a sms message to let you know there is a offer? Wow thats a great news for google i am very glad after seen this ..
Job Tips, Interview Tips, Latest Text papers, Exam Results, Question papers, Answer papers, Job Applications, Online Education Topics. you find and discover places to eat, shop and play! Wow! nice functions. Thanks for the information. Your content is really great and informative as well as so helpful for my Mobile Payment Market Research and Development. great news..Thanks for my adroid phone I can now visits places that I never been to. Thanks a lot for posting such an informative blog article. This Google Business Photos Feature sounds very interesting to me. Now apart from SMS Feature, a mobile phone has reached quite far away by now. Now features like web to sms are also coming into the mobile market. Hat's off to Google , they are so deep into technology that they come up with something new everytime.